Designer Sarah Wittenbraker layers bold patterns and colors with a fashion lover’s eye in her dreamy pad. Austin designer Sarah Wittenbraker comes from a long line of fearless women. “My mom has such an eye for mixing patterns,” she says. “She wasn’t afraid to wallpaper the kitchen or upholster something in a bright color.” As a kid growing up in Dallas, Wittenbraker frequented vintage stores and was always pulling together outﬁts from mismatched pieces. “I’m as inspired by fashion as I am by interiors,” she explains. In her own space, a 1960s brick home in the Tarrytown neighborhood near Lake Austin, she starts with her love for wallpaper. The ﬁrst pattern the designer chose was of mini ﬂuorescent mushrooms on black paper from British brand 17 Patterns. “I couldn’t afford a lot of it, so I put a small dose in the back of the bar,” Wittenbraker explains. “That set the tone for the whole house.” For months, the living room remained mostly black and white until she added a vintage sofa upholstered in a bold ﬂoral fabric. Slowly, more colors and textures came in: a powder blue–upholstered bench from Austin vintage store Wendow; an abstract painting by local artist Diana Greenberg; and vintage safari chairs in chrome, brass, and gray suede. Leaving the right amount of breathing room can sometimes prove difficult. “Restraint is really hard for me in my own house,” Wittenbraker admits. To balance the busyness, she focuses on the feeling she wants to achieve in each space. In the kitchen, where the family cooks and the kids do their homework, she maintained a simple palette of white soapstone counters, deep blue cabinets, and brass trim work. A series of subtle but distinctive decorative square reliefs carry from the kitchen into the living areas, then outside to the exterior walls and door. In the entryway, the same motif transforms into a graphic Lee Jofa paper covering the walls and ceiling, paired with a botanical print from Austin’s beloved Supply showroom. Curves and nature-inspired patterns soften clean lines, and a mélange of modern and traditional details create recurring themes that don’t feel tethered to any single era. Abstract prints throughout the house—in art, wall decor, and textiles (above), as well as the backsplash in the butler pantry—are balanced by hints of sunny yellow, bright florals, and the palest blush. The home is a collaborative project, informed by contributions from Wittenbraker; her architect, Elizabeth Baird; and every member of the family, including husband Rick and kids Lulu (13), Oscar (10), and Beatrice (8). Encouraging the same sense of self-expression her mom instilled in her, Wittenbraker let the children select their own fabric and wallpaper for their rooms. Lulu chose a coral headboard and Flat Vernacular ﬂoral curtains; Oscar opted for a “climbing room,” complete with monkey bars; and Beatrice picked pink for the walls and navy peacock curtains from Tilton Fenwick. That job quickly led to referrals and a fully booked calendar. “Those early years were super-tough,” Wittenbraker recalls. “I felt like I had to take every job to make ends meet, I wasn’t charging enough, and I was racing around with three children.” With the help of a mentor, she restructured her business, hired staff, and raised her rates. Her studio is currently in the midst of its ﬁrst large commercial project, Austin’s Domain Northside shopping center, where she is commissioning large-scale outdoor sculptures from local artists. If bravery is being yourself, in spite of fears and failures, Wittenbraker lives it. In her dining room wallpaper, a little bug appears every so often in the repeat of the climbing-vine pattern, making its way across the leaves. It’s her favorite detail and an apt metaphor for her home. “It’s clean where it needs to be, crazy where it needs to be, and there’s plenty of room to evolve,” she says. Inspired by fashion, Wittenbraker often uses clothing as a starting point for interiors. Here, she shares her go-to strategies. “It’s very hard for me to buy a little black dress,” she admits. “Instead, I’ll look for a bright color like chartreuse.” Similarly, no room in her home is without a pop of pink, gold, or peacock blue. “I can’t not have a big, vintage brass and gold necklace,” says Wittenbraker. In her home, brass shows up in the details—the hardware in the kitchen, the handles on the dining chairs, and the barware in the living room. 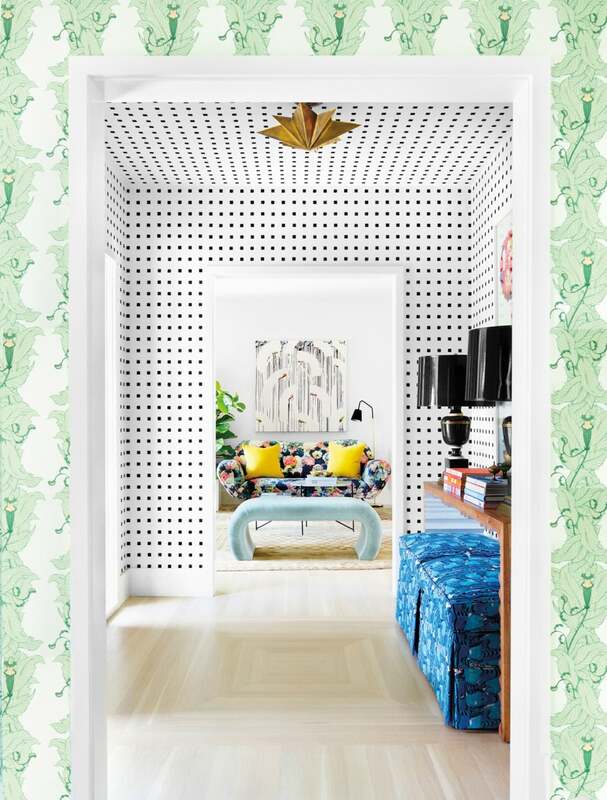 A wallpaper whiz, Wittenbraker excels at playing up out-of-the-way nooks and smaller spaces with fun, impactful patterns—like the chic bar station. Feeling inspired? Recreate the home’s bright and lustrous aesthetic with these chic finds.